Perhaps due to the royal heritage of the region, or due to the unique characteristics of the cuisine brought about by the region’s extreme climate and rare vegetation, Rajasthani cuisine is quite different from all other cuisines and is very fascinating too! Rajasthani food is usually spicy and makes use of loads of ghee, without which no dish is complete. Heart-warming meal combos like the Dal-Baati-Churma and other specialties like Panchmel ki Subzi, Gehun ki Bikaneri Khichdi and Mangodi ki Dal are popular all over the country and this section shows you how to recreate the magic of Rajasthan food in your own kitchen. 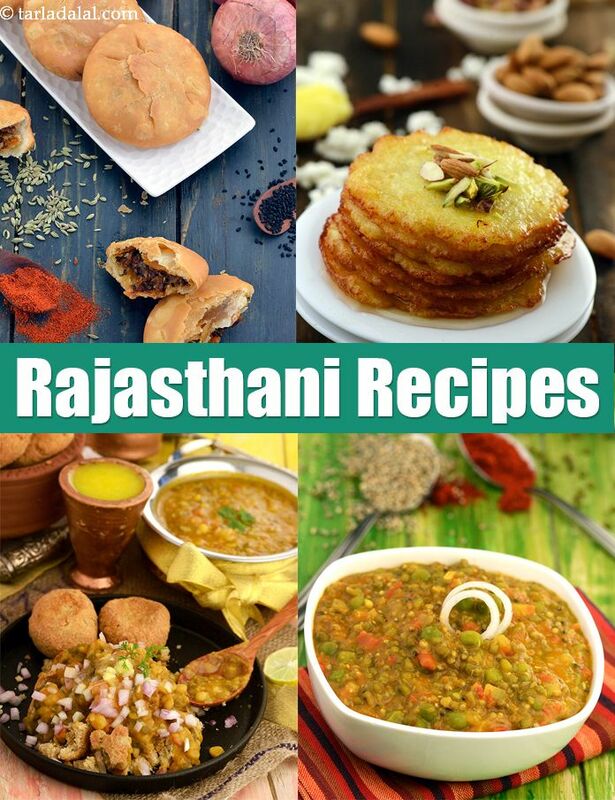 Enjoy our selection of Rajasthani recipes like Rajashtani Sabzis with the famous Rajashtani Rotis and ever popular Achars. Top of your meal with some amazing rich, mouthwatering Rajasthani Sweet and Rajasthani snack. The Rajasthanis specialise in serving sweet and savoury dishes in combinations that steal the heart and delight the taste buds . Dal bati churma a three-in-one treat, is a traditional combination of sweet dish churma, spicy dal and deep-fried Bati and a wonderful way to warm yourself up on a cold day! Because of the climatic conditions, there is scarcity of water resulting into a dearth of fresh vegetables, the available vegetables are often combined with pulses, lentils and dried/ preserved foods like papads and wadis. Also, water is substituted with dairy products like milk and buttermilk. Gram flour dumplings perked up with a myriad of spices then steamed and cut into small bite sized pieces are cooked in a curd based gravy till thick to make Gatte ki subzi that tastes amazing with both rice and parathas. Papad ki subzi, a combination of moong dal mangodi and papd to make Papad Mangodi ki Subzi are some other delectable Rajasthani subzis. Also, try your hands on other Rajasthani dishes like Ker sangria, Gavarfali ki Subzi, Bharwa Lauki. Complement your meal with nourishing dals/kadhi that will complete your meal. Rajasthani recipes like Pakoda kadhi or pithore kadhi are flavorful, irresistible accompaniments that you must try.Also, finger-licking dals like Dal Banjari, Mooli moong dal or Palak toovar dal with a tempering of ghee and authentic Rajasthani flavor are some delights that will surely replace your regular dals. When we talk about snacks, Rajasthan Food is synonymous to kachori. The endless varieties of kachoris found at most 'namkeen' shops are famous worldwide. Pyaaz Kachori, Shahi Raj Kachori, Matar ki Kachori are some popular kachoris. Rajasthanis don’t hold back on the use of full-fat milk and ghee in their mithai. No wonder the sweet dishes of Rajasthan tastes so heavenly! Apart from the savoury kachoris, you can also found sweet varieties like Mawa Kachoris that are stuffed with a rich mixture of khoya and dry-fruits, deep-fried and dipped in sugar syrup. Malai Ghevar, a honeycomb shaped delicacy made using plain flour and ghee is an authentic sweet made on auspicious occasions and festivals. People love to gather around the warmth of the kitchen fire, to enjoy rustic, homely rotis right off the tava. Wheat flour rotis, parathas, masala baati generously drizzled with ghee are enjoyed with subzis. Winters are harsh in this region. Steaming hot Khichdi, Gaund ke ladoo, Moong dal halwa, Badam ka halwa are some vegetarian dishes eaten to keep the body warm on a cold winter’s night! We hope you enjoy our collection of Rajasthani Recipes and will find the below related Rajasthani Food articles and Rajathani recipes. Potatoes and pumpkin (petha) are favourite vegetables of the Rajasthanis and feature in different ways in their meals. Aloo Pethe ka Saag cooked with whole spices and curds can be relished with plain or stuffed puris. The addition of fennel gives this vegetable its characteristic Rajasthani flavour. Amlana is a delicious Rajasthani drink made with tamarind pulp, perked up with spices like pepper and cardamom. The addition of black salt imparts a wonderful flavour, which is further enhanced by the minty garnish. Chill this drink really well before serving! This is a type of rajasthani kadhi. yes i have many from these. really it was so tasty and i also tried many of them at my home everyone loved it..
Tarla Dalal Hi Karan, Happy to know you liked this recipe. Do try more and more recipes and share with us your feedback. Happy Cooking!